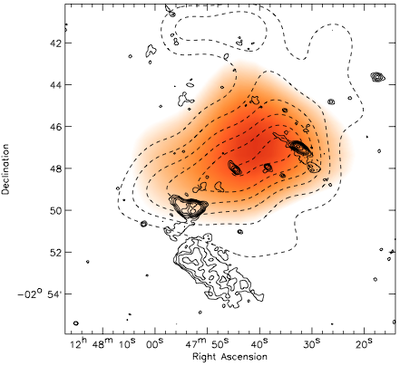 Abell 1612 is a very little studied cluster. van Weeren et al. (2011) provide the only targeted analysis of the system, there they find evidence for it being a post merger radio relic cluster. From ROSAT X-ray imaging they find an elongated gas distribution that is in agreement with the elongated (slightly bimodal) galaxy distribution based on SDSS imaging. With GMRT observations they find diffuse radio emission for which they cannot find an optical counter part. 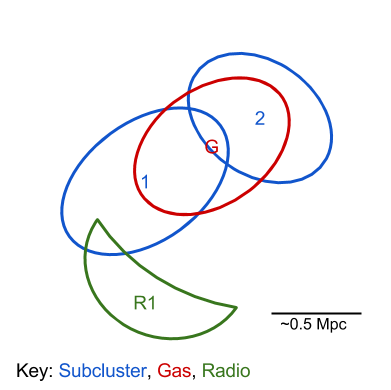 They suggest that the relic traces a shock where particles have been accelerated by a merger related shock. 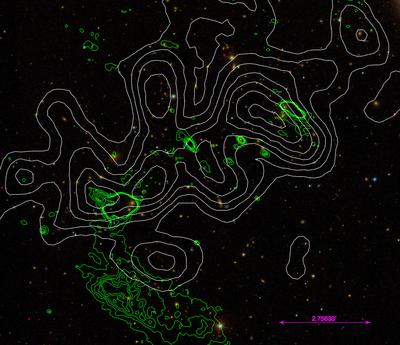 Based on SDSS photo-z galaxy number density, ROSAT X-ray and GMRT 325 MHz radio.